Dit extra lange board is geschikt voor 2-3 personen om op 1 board langere tochten te kunnen maken! 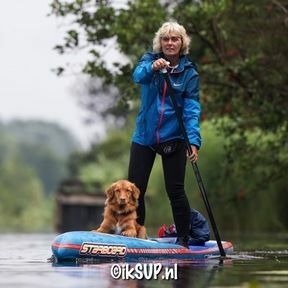 Ideaal als je met z'n tweetjes je (wat grotere) hond mee wilt nemen! When you unpack your Red Paddle Co board for the first time, inside you’ll find the lightweight Titan pump. It’s the world’s best SUP pump and was created by our expert engineers to make inflating your board a cinch. The secret is in the dual-chamber system and high-flow handle, which pumps air into your board at up to 60mph, ensuring it inflates to the recommended pressure level while using less of your energy. The tandem is also supplied with our classic HP Pump so you can share the load of pumping and both keep going until you have reached the desired pressure. The Voyager Tandem comes fitted with two special fixings that are compatible with Railblaza and Ram Mounts products, enabling you to securely attach a mobile phone, action camera, your paddle when you’re taking a dip, or even a fishing rod.